Luke Skywalker’s bionic hand is a step closer to reality for amputees in this galaxy. Researchers at the Georgia Institute of Technology have created an ultrasonic sensor that allows amputees to control each of their prosthetic fingers individually. It provides fine motor hand gestures that aren’t possible with current commercially available devices. Ayanna Howard named chair of School of Interactive Computing. Last Halloween, Sonia Chernova hardly left her doorstep in Decatur, Georgia, handing out candy to a constant stream of kids. This year, she put an autonomous robot on the porch to do it for her. It gave out 1,000 pieces in three hours to hundreds of kids. The U.S. Army Research Laboratory has awarded an alliance headed by the University of Pennsylvania a five-year, $27 million grant to develop new methods of creating autonomous, intelligent and resilient teams of robots. Luke Drnach and Katelyn Fry met through a first-of-its-kind traineeship in health care robotics offered by Georgia Tech and Emory University. ECE Professor Ayanna M. Howard has been named as a recipient of the Walker’s Legacy Power25 Atlanta Awards. Michael Jeffries, a research technologist in the Aerospace, Transportation and Advanced Systems (ATAS) with the Georgia Tech Research Institute (GTRI), has turned his hobby of robot building and battling into a turn on ABC’s BattleBots. The Robotarium held its grand opening on Tuesday in the Van Leer Building. Appropriately, a scissor-wielding robot (named Snips) cut the ribbon. Later, a researcher from the University of Illinois at Urbana-Champaign skyped into the room to run a live remote experiment. This month Georgia Tech opens the Robotarium, a $2.5 million lab funded by the National Science Foundation (NSF) and Office of Naval Research. 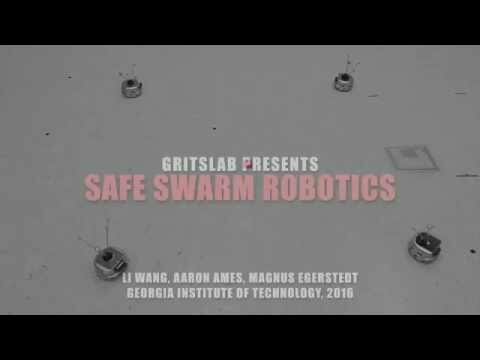 The 725-square-foot facility houses nearly 100 rolling and flying swarm robots that are accessible to anyone. Researchers from around the globe can write their own computer programs, upload them, then get the results as the Georgia Tech machines carry out the commands. The researcher later receives video and data from the experiment. The Robotics Industries Association (RIA) announced its new board members, including the Institute for Robotics and Intelligent Machine’s (IRIM) Gary McMurray. The human brain's computational might is the envy of computer engineers, and emulating it is coming a step closer thanks to new nanomaterials. Georgia Tech research engineers have created next-generation brain-mimmicking memory via "memristors" to underly processing "neuristors." The engineers are using them to make an artificially intelligent retina that could spot enemy aircraft or find missing children. 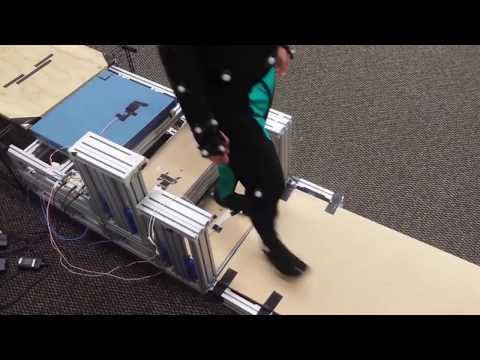 Researchers have created a device that makes walking up and down stairs easier. They’ve built energy-recycling stairs that store a user’s energy during descent and return energy to the user during ascent. 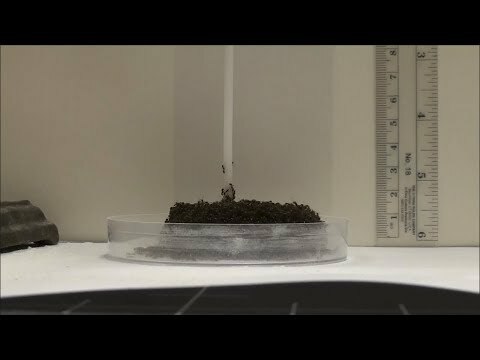 Fire ants use their bodies to construct Eiffel Tower-looking structures when they run into a tall obstruction while looking for food or escaping to new areas. A new study suggests that they build these structures without a leader or coordinated effort. Each ant wanders around aimlessly, adhering to a certain set of rules, until it unknowingly participates in the construction of a tower several inches tall. The Boeing Manufacturing Development Center works to implement automation in industrial applications. It is one of 17 corporate innovation centers on Georgia Tech’s campus. Gary McMurray testified before the Senate Committee on Agricultural, Nutrition and Forestry Thursday. McMurray leads the Food Processing Technology Division at the Georgia Tech Research Institute. Researchers fed a robot nearly 5,000 complete songs — from Beethoven to the Beatles to Lady Gaga to Miles Davis — and more than 2 million motifs, riffs and licks of music. The four-armed, marimba-playing machine is using deep learning to write and play its own music. ECE Ph.D. student Maria Santos has been chosen for a La Caixa Fellowship for Graduate Studies in North America. An interdisciplinary team of graduate students and faculty from the Institute for Robotics and Intelligent Machines (IRIM) won the Best Multi-Robot Systems Paper Award at the 2017 IEEE International Conference on Robotics and Automation (ICRA). 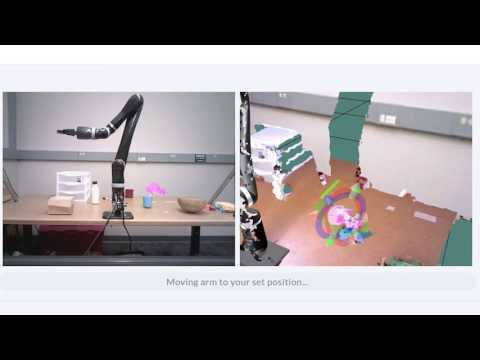 A new interface designed by Georgia Institute of Technology researchers allows users to simply point and click on an item, then choose a grasp, to control a robot remotely. In what may have been the first aerial encounter of its kind, researchers recently pitted two swarms of autonomous aircraft against one another over a military test facility. While the friendly encounter may not have qualified as an old-fashioned dogfight, it provided the first example of a live engagement between two swarms of unmanned air vehicles (UAVs), and allowed the two teams to demonstrate different combat tactics in flight. A talented trio of Georgia Tech students will go down in history as the first team to win the Collegiate Drone Racing National Championship. Johns Hopkins’ Gregory S. Chirikjian will join IRIM as its first Visiting Faculty Fellow on Monday, April 17. Associate Dean for Research Nancey Green Leigh answered a few questions about the future of robotics at the College of Design and Georgia Tech. The Robotics Industries Association (RIA) recently announced its new board members, including the Institute for Robotics and Intelligent Machine’s (IRIM) Larry Sweet. Georgia Tech graduate student Vivian Chu joins a distinguished group of roboticists named on Robohub’s 2016 list of “25 Women In Robotics You Need To Know About. Do cyborgs really need to eat? Granted, there’s no practical way to answer this question at the moment, but with robotics technology improving rapidly each year, the question of fuel sources is a fascinating one. Is organic fuel for cyborgs a necessity? Couldn’t they just power up throughout the day by plugging in a USB or a charger? ECE Professor Ayanna Howard was one of the scientists game enough to lend their knowledge and experience to speculate on this topic. Nancey Green Leigh is the principal investigator of a new $784,887 grant from the NSF National Robotics Initiative to study the U.S. robotics industry and the economic impacts of robotics technology. This year we have a number of faculty openings across campus, including in multiple units in the College of Engineering and the College of Computing's School of Interactive Computing. New algorithms allow any number of robots to move within inches of each other, without colliding, to complete their task — swapping locations on his lab floor. They are the first researchers to create such minimally invasive safety algorithms. The Georgia Institute of Technology today announced the appointment of Magnus Egerstedt as the new executive director of the Institute for Robotics and Intelligent Machines (IRIM). The videos cover an extended period of time and offer a behind-the-scenes look at different aspects of the earlier days of unmanned vehicle and other robotics research conducted across multiple institutions, companies, and funding agencies. 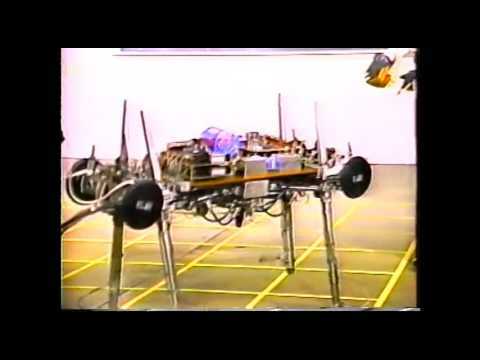 Researchers have created what they say is the most efficient-walking humanoid ever. 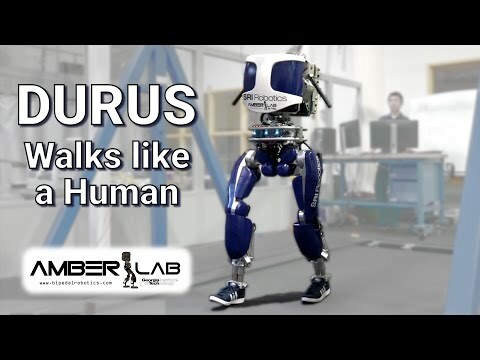 While most machines these days are hunched at the waist and plod along on flat feet, DURUS strolls like a person. It lands on the heel of its foot, rolls through the step and pushes off its toe. It’s even outfitted with a pair of size-13 shoes. When early terrestrial animals began moving about on mud and sand 360 million years ago, the powerful tails they used as fish may have been more important than scientists previously realized. That’s one conclusion from a new study of African mudskipper fish and a robot modeled on the animal. Should Robots Decide Who Lives or Dies? A Professor Built an AI Bot to Make Teaching Easier. Will It Replace Him Someday? Professor Ashok Goel uses IBM's Watson platform to design Jill Watson, a virtual teaching assistant. She was one of nine TAs in Goel's artificial intelligence online course. He surprised his students at the end of the semester; no one guessed she wasn't a human. To learn more about the lecture series and read the lecture transcript, please visit the IRIM website. ECE Professor Ayanna Howard has been selected as the 2016 recipient of the A. Nico Habermann Award, given by the Computing Research Association (CRA). The rapid pace of artificial intelligence (AI) has raised fears about whether robots could act unethically to harm humans. But how can robots learn ethical behavior if there is no “user manual” for being human? Researchers Mark Riedl and Brent Harrison from the School of Interactive Computing believe the answer lies in “Quixote” – unveiled at the AAAI-16 Conference in Phoenix, Ariz. (Feb. 12 – 17). We are pleased to announce that five faculty members have been competitively selected as participants in the Georgia Tech - JPL summer 2016 faculty collaboration program sponsored by the Georgia Tech Center for Space Technology and Research and the NASA Jet Propulsion Laboratory. The Georgia Institute of Technology is building a new lab that will allow roboticists from around the country to conduct experiments remotely. Researchers from other universities, as well as middle and high school students, will schedule experiments, upload their own programming code, watch the robots in real-time via streamed video feeds and receive scientific data demonstrating the results. Priyam Parashar, a first-year student in the Robotics Ph.D. Program at Georgia Tech, received the first Georgia Robotics Fellowship, established earlier this year by local non-profit Georgia Robotics. 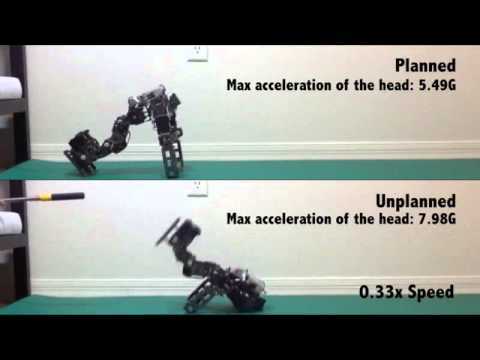 Researchers have identified a way to teach robots how to fall with grace and without serious damage. The new algorithm tells a robot how to react to a wide variety of falls – from a single step to recover from a gentle nudge, to a rolling motion that breaks a high-speed fall. As a result, robots can minimize the damage or injury they might cause to themselves or others while falling by learning the best sequence of movements to slow their momentum. Having a light touch can make a hefty difference in how well animals and robots move across challenging granular surfaces such as snow, sand and leaf litter. Research shows how the design of appendages – whether legs or wheels – affects the ability of both robots and animals to cross weak and flowing surfaces. ECE Professor Ayanna Howard has been named to The Root 100 2015, a list of 100 African-Americans ages 25 to 45 who are responsible for the year’s most significant moments, movements, and ideas. As an undergraduate computer engineering major, English joined the Opportunity Research Scholars (ORS) program. Now English’s graduate research is an ORS project and she is mentoring a fresh new crop of undergraduates. 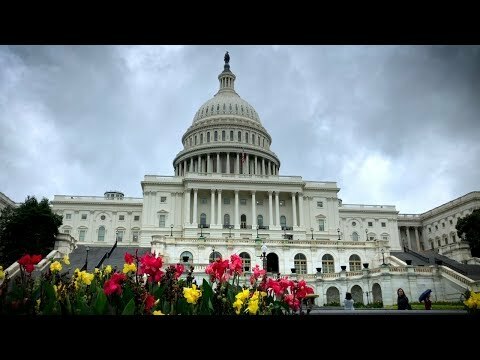 A team of robots and researchers from Georgia Tech’s Center for Music Technology is headed to Washington, D.C., to play a concert at the historic Kennedy Center. Professor Gil Weinberg and his machines, Shimon and three Shimi robots, will perform July 22 on the Center’s Millennium Stage. The performance is part of the Smithsonian Institution and Kennedy Center’s 25/40 celebration, which commemorates the 25th anniversary of the Americans with Disabilities Act and the 40th year of VSA, the international organization on arts and disability. National Robotics Week 2015 Is Here! Icefin Robot: Today, Exploring Antarctica’s Depths. Tomorrow, Jupiter’s Moon? At Georgia Tech, robots are teaming up with humans to perform tasks in manufacturing, health care, national defense and other areas. The National Science Foundation (NSF) and the United States Department of Agriculture (USDA) awarded nearly $3 million to fund projects led by Georgia Tech robotics researchers. The principal investigators (PIs) and co-PIs for these projects represent three of the Institute’s six colleges, plus the Georgia Tech Research Institute (GTRI). The Anita Borg Institute (ABI) has announced that ECE Professor Ayanna Howard will receive the prestigious A. Richard Newton Educator ABIE Award. World Cup Fans Prepare: The Robots Are Headed Your Way! A week after the World Cup title game in Rio de Janeiro, teams from 45 countries will face off at RoboCup about 1,200 miles away in the Brazilian coastal town of João Pessoa. Georgia Tech researchers have created a functional MRI-compatible hemiparesis rehab device that creates a long latency stretch reflex at the exact time as a brain signal. It is designed to assist stroke victims. With the help of a smart tablet and Angry Birds, children can now do something typically reserved for engineers and computer scientists: program a robot to learn new skills. 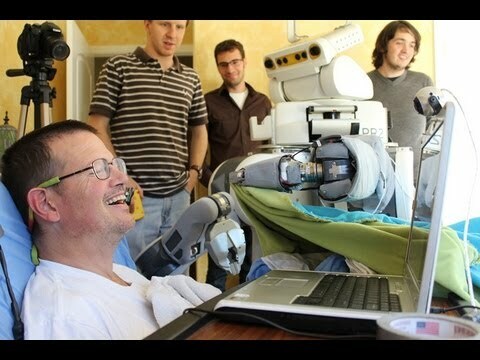 The Georgia Institute of Technology project is designed to serve as a rehabilitation tool and to help kids with disabilities. The ways in which animals are helping Georgia Tech researchers transform the world. Tesca Fitzgerald, who begins her second year in the College of Computing's Computer Science Ph.D. program this fall, is one of 11 women featured in Google’s new Made with Code initiative to champion creativity, girls, and code, all at once. Three teams will travel to Michigan, Brazil and Canada for competitions. Assistant Professor Mike Stilman, recognized as an emerging leader in humanoid robotics research, died following an apparent accident at his Atlanta home on Tuesday, May 6. Google Glass—Wearable Tech but Would You Wear It? You’ve probably heard that Georgia Tech has a number of Interdisciplinary Research Institutes (IRIs) – but do you know much about them? This article is one in a series of Q&As to introduce the Tech community to the 10 IRIs and their leaders. In this installment, Executive Director of the Institute for Robotics and Intelligent Machines (IRIM) Henrik Christensen answers questions about IRIM and also talks about its efforts to support Georgia Tech faculty and students. Georgia Tech was one of the first nodes in the NSF's I-Corps program, which helps faculty members commercialize research discoveries. A dozen teams from Georgia Tech have now completed the program, and several companies have resulted. Using arm sensors that can “read” a person’s muscle movements, Georgia Institute of Technology researchers have created a control system that makes robots more intelligent. The sensors send information to the robot, allowing it to anticipate a human’s movements and correct its own. The system is intended to improve time, safety and efficiency in manufacturing plants. How Soon Can You Expect Drone Deliveries? The Georgia Institute of Technology has announced the launch of its Institute for Robotics and Intelligent Machines (IRIM), the newest of Georgia Tech’s ten Interdisciplinary Research Institutes (IRIs). IRIM brings together robotics researchers from across campus—spanning colleges, departments and individual labs—to support and connect research initiatives, enhance educational programs and foster advances for the National Robotics Initiative (NRI), first announced by President Obama in 2011, and officially established in 2012. Anthony J. Yezzi has been named as the Julian T. Hightower Chair Professor, effective October 1. What Should a Robot Look Like? A new study from the Georgia Institute of Technology finds that older and younger people have varying preferences about what they would want a personal robot to look like. And they change their minds based on what the robot is supposed to do. The National Science Foundation (NSF) awarded funding for four robotics projects with applications in various innovative areas. Assistant Professor Mike Stilman of the School of Interactive Computing has been selected for a 2013 Young Faculty Award by the Defense Advanced Research Project Agency (DARPA). ECE Professor Magnus Egerstedt has been named as the 2013 Alumnus of the Year by the Royal Institute of Technology in Stockholm, Sweden. With a new type of engineering class, ECE Professor Magnus Egerstedt has a chance to educate thousands. Can he pull it off? A multi-university team that includes Georgia Tech's Mike Stilman has been advanced to the next round of the Defense Advanced Research Project Agency’s Robotics Challenge. ECE's Erin Hanson has received a scholarship under the Science, Mathematics, and Research for Transformation Program, which is administered by the U.S. Department of Defense. Antenna technology originally developed to quickly send and receive information through a software-defined military radio may soon be used to transmit ocean data from a wave-powered autonomous surface vehicle. The technology, the lowest-power method for maintaining a satellite uplink, automatically compensates for the movement of the antenna as the boat bobs around on the ocean surface. ECE Professor Ayanna Howard has been appointed as a member of the 2014-2015 Defense Science Study Group (DSSG), a program directed by the Institute for Defense Analyses and sponsored by the Defense Advanced Research Projects Agency. What do swimmers like trout, eels and sandfish lizards have in common? According to a new study, the similar timing patterns that these animals use to contract their muscles and produce undulatory swimming motions can be explained using a simple model. Scientists have now applied the new model to understand the connection between electrical signals and body movement in the sandfish. ECE Professor Ayanna Howard and two of her Ph.D. students, Hae Won Park and Richard Coogle, took the first place prize at the DARwIn-OP Humanoids Application Challenge at the 2013 International Conference on Robotics and Automation (ICRA 2013). Future teams of subterranean search and rescue robots may owe their success to the lowly fire ant, a much despised insect whose painful bites and extensive networks of underground tunnels are all-too-familiar to people living in the southern United States. Based on a Georgia Institute of Technology study, it appears that the healthcare providers will welcome robots into the workplace. y may be welcomed with open arms depending on the tasks at hand. Robots are now able to intelligently maneuver within clutter, gently making contact with objects while accomplishing a task, thanks to technology developed by Dr. Charlie Kemp and the Healthcare Robotics Lab. Based on a study of both hatchling sea turtles and "FlipperBot" -- a robot with flippers -- researchers have learned principles for how both robots and turtles move on granular surfaces such as sand. In a recent interview with Steven Cherry for IEEE Spectrum’s “Techwise Conversations,” In a recent interview with Steven Cherry for IEEE Spectrum’s “Techwise Conversations,” Henrik Christensen, director of the Robotics & Intelligent Machines Center (RIM) at Georgia Tech, dispels many of the myths surrounding the threat of automation to the American workforce. 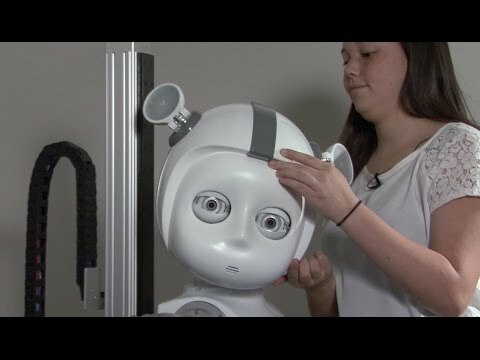 Instead of programming a robot to copy an existing dance such as those in the online videos, Amy LaViers, a Ph.D. candidate in electrical and computer engineering, is defining the various styles of human movement and creating algorithms to reproduce them on a humanoid robot. Ayanna Howard has been awarded a NSF REU Site: Summer Undergraduate Research in Engineering (SURE) continuing grant for her proposal to add a robotics component to Georgia Tech’s SURE program. Robots are being used more widely than expected in a variety of sectors, and the trend is likely to continue with robotics becoming as ubiquitous as computer technology over the next 15 years, according to the new report. The Robotics & Intelligent Machine Center’s faculty members have technically diverse backgrounds and conduct innovative research to advance robotics. Recently, six of RIM’s outstanding faculty members received promotions within their academic units in the Colleges of Computing, Engineering and Science. ECE Professor Magnus Egerstedt has been appointed as the Schlumberger Professor, effective March 1. He is the first faculty member in the School of Electrical and Computer Engineering (ECE) to hold this new professorship. Robots Assisting or Hurting Manufacturing in America? Using deceptive behavioral patterns of squirrels and birds, researchers at the Georgia Institute of Technology have developed robots that are able to deceive each other. The research is funded by the Office of Naval Research and is led by Professor Ronald Arkin, who suggests the applications could be implemented by the military in the future. The research is highlighted in the November/December 2012 edition of IEEE Intelligent Systems. A Georgia Tech research team has received a grant from the Office of Naval Research to work on a project that intends to teach robots how to use objects in their environment to accomplish high-level tasks. ECE Professor Anthony J. Yezzi has been named as a Ken Byers Professor, effective October 1. Andrea Thomaz Named "Brilliant 10"
ECE Professor Ayanna Howard has been named as the Motorola Foundation Professor, effective August 15. Researchers have used complex computational models to design micro-swimmers that could overcome the challenges of swimming at the micron scale. These autonomous micro-robots could carry cargo and navigate in response to stimuli such as light. 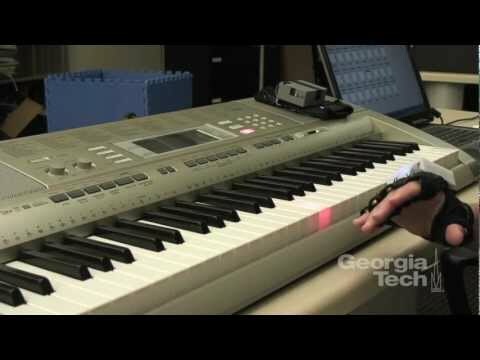 Researchers at Georgia Tech and Atlanta's Shepherd Center have created a wireless, musical glove that may improve sensation and motor skills for people with spinal cord injuries (SCI). The gadget, Mobile Music Touch, was successfully used by individuals with tetraplegia who suffered their injury more than year before the study, a time frame when most rehab patients see very little improvement for the remainder of their lives. Using piezoelectric materials, researchers have replicated the muscle motion of the human eye to control camera systems in a way designed to improve the operation of robots. This new muscle-like action could help make robotic tools safer and more effective for MRI-guided surgery and robotic rehabilitation. 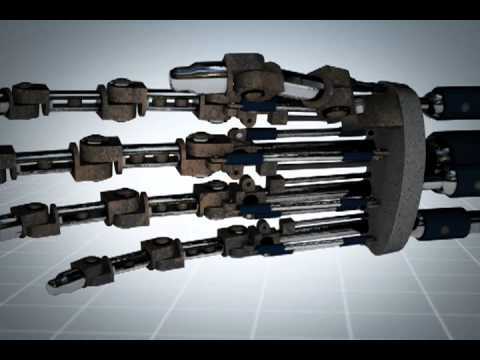 Could We Trust Killer Robots? Researchers have automated the process of finding and recording information from neurons in the living brain. A robotic arm guided by a cell-detecting computer algorithm can identify and record from neurons in the living mouse brain with better accuracy and speed than a human experimenter. The Georgia Institute of Technology was honored by Boeing on April 18 for its exceptional performance and contributions to the company’s overall success during 2011. The Georgia Institute of Technology opened its doors to more than 400 middle school and high school students on Wednesday for the third annual Robotics Open House. Designing an all-terrain robot for search-and-rescue missions is an arduous task for scientists. The machine must be flexible enough to move over uneven surfaces, yet not so big that it’s restricted from tight spaces. It might also be required to climb slopes of varying inclines. Existing robots can do many of these things, but the majority require large amounts of energy and are prone to overheating. Georgia Tech researchers have designed a new machine by studying the locomotion of snakes. The Georgia Institute of Technology has been awarded a contract from the U.S. Defense Advanced Research Projects Agency (DARPA) to provide manufacturing education programs to high school students. The National Science Foundation has awarded $6 million through its Division of Emerging Frontiers in Research and Innovation to fund three projects involving researchers from the Georgia Institute of Technology. Georgia Tech researchers have developed a glove with a special fingertip designed to improve the wearer's sense of touch. Applying a small vibration to the side of the fingertip improves tactile sensitivity and motor performance, according to their research results. Georgia Tech President G. P. “Bud” Peterson is participating in a national meeting focused on advanced manufacturing today in Pittsburgh. The gathering is part of President Barack Obama’s initiative focused on making American manufacturing more competitive. President Barack Obama today named Georgia Tech President G. P. “Bud” Peterson to the Advanced Manufacturing Partnership steering committee. In a project sponsored by the Army Research Laboratory, researchers are giving autonomous robots the ability to work together to explore and map the interiors of buildings. Beyond soldiers, the capability could also help civilian first responders. The new Robotics and Intelligent Machines Center is an interdisciplinary effort, leveraging the strengths and expertise of the Colleges of Computing and Engineering, and the Research Institute at Georgia Tech. The countdown begins for RoboCup 2007 Atlanta. The world's most renowned competition for research robotics, RoboCup 2007 Atlanta will be held at Georgia Tech July 3-10. The Sting Racing team will be one of 36 teams competing in the Defense Advanced Research Project Agency's (DARPA) Urban Challenge this fall. When thinking of the Georgia Institute of Technology, two key attributes consistently come to mind - innovation and tradition. A recent challenge for Georgia Tech's communications team was developing a television spot that would demonstrate, in just 30 seconds, the Institute's long tradition of being a technological leader, while also capturing more than 100 years of school spirit. Georgia Tech and Emory researchers have created a computer simulation that sheds new light on how the nervous system reinvents its communication with muscles after sensory loss. The findings could someday be used to better diagnose and rehabilitate patients with balance problems by retraining their muscles and improving overall balance. The College of Computing at Georgia Tech today announced that the Sting Racing team, a collaboration between Georgia Tech and Science Applications International Corporation [NYSE: SAI], has left for Victorville, Calif. to compete in the Defense Advanced Research Projects Agency’s (DARPA) Urban Challenge semifinals and finals events with their fully autonomous vehicle entry, Sting 1. The Sting Racing Team sponsored by Georgia Tech and SAIC reached the semifinals of the Defense Advanced Research Projects Agency's Urban Challenge, but did not quality for the final challenge. Tech Offers First Interdisciplinary Robotics Ph.D. The Colleges of Computing and Engineering at Georgia Tech announced the nation's first interdisciplinary doctoral degree in robotics to be offered at Georgia Tech. The program starts fall semester of 2008 and was developed through Georgia Tech's Center for Robotics and Intelligent Machines (RIM@Georgia Tech). Researchers at Georgia Tech and Emory University have created a robot, designed to help users with limited mobility with everyday tasks, that moves autonomously to an item selected with a green laser pointer, picks up the item and then delivers it to the user, another person or a selected location such as a table. 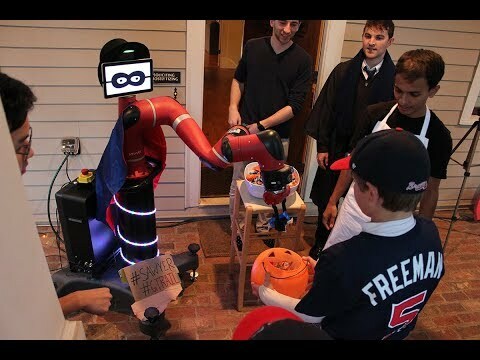 The new robotic communication method may help robots find their way into the home sooner. Citing the critical importance of the continued growth of robotics to U.S. competitiveness, 11 universities are taking the lead in developing an integrated national strategy for robotics research. The United States is the only nation engaged in advanced robotics research that does not have such a research roadmap. Researchers at the Georgia Institute of Technology have created specially designed robots called SnoMotes to traverse potentially dangerous ice environments. The SnoMotes work as a team, autonomously collaborating among themselves to gather data that could give scientists a better understanding of the important dynamics that influence the stability of ice sheets. The Georgia Tech Aerial Robotics (GTAR) team finished first in the 2008 International Aerial Robotics Competition at the McKenna Soldier Battle Lab facility in Fort Benning, Georgia. Georgia Tech has created an improved version of the robotic percussionist. The second edition, named Shimon, is designed to play a melodic instrument, the marimba. It, therefore, utilizes more sophisticated algorithms for music perception and improvisation in comparison to Haile, Georgia Tech's first robotic drummer. Can Robots Be More Ethical Than Soldiers? Most people would marvel at the 1970s television show "The Bionic Woman" and just hope to emulate the technologically advanced heroine. Not a young Ayanna MacCalla Howard. A robotics team from Georgia Tech-Savannah received a design award during the recent Marine Advanced Technology Education Center's (MATE) 2009 International Student Remotely Operated Vehicle (ROV) Competition. Andrea Thomaz, an assistant professor in interactive computing at the Georgia Institute of Technology, has been recognized by Technology Review magazine as one of the world's top innovators under the age of 35. Fumin Zhang, assistant professor in the School of Electrical and Computer Engineering (ECE), has received a National Science Foundation (NSF) CAREER Award for his project entitled "Feasibility of control tasks-towards control-computing-power co-design." Dr. Zhang is the third ECE faculty member from Georgia Tech-Savannah to receive this honor. Fumin Zhang has won an Office of Naval Research Young Investigator Award for his project proposal entitled "Generic Environmental Models (GEMs) for Agile Marine Autonomy." Dr. Zhang is an assistant professor in the School of Electrical and Computer Engineering at the Georgia Tech-Savannah campus. Georgia Tech researchers have published the first detailed examination of robot deception. They developed algorithms that allow a robot to determine whether it should deceive, and help the robot select the best deceptive strategy to avoid getting caught. 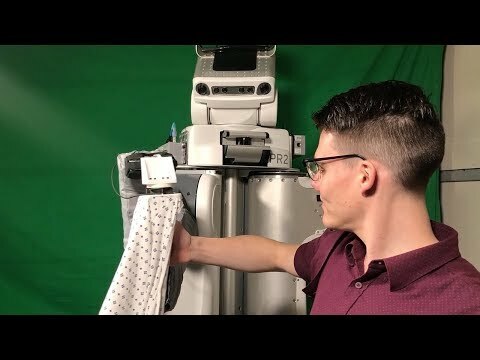 Professor Charlie Kemp and Advait Jain at Georgia Tech's Healthcare Robotics Laboratory have programmed a robot to autonomously approach and open doors and drawers. Student, faculty, staff, and alumni volunteers are needed to assist at the State of Georgia FIRST LEGO League Robotics Tournament, to be held on Saturday, January 29, 2011 from 7 am-5 pm at the Georgia Tech Student Center. The School of Electrical and Computer Engineering; the Center for Education Integrating Science, Mathematics, and Computing; and the LEGO Robotics Design and Outreach Community are co-hosting this event.